Northern Illinois University hosted the 54th annual American Society of Agronomy Region 3 Soil Judging Contest on October 8 and 9. The contest took place in DeKalb and Kane Counties. Sixty-five individuals from six teams (Northern Illinois University, Purdue University, University of Illinois, University of Wisconsin-Madison, University of Wisconsin-Platteville, and University of Wisconsin-Stevens Point) participated in the contest. The contest was organized by Dr. Mike Konen (NIU). Soil pits were dug by Ron Collman (USDA-NRCS) and Zach Weber (USDA-NRCS). Mark Bramstadt (USDA-NRCS), Bill Kreznor (Kreznor and Associates), Bruce Putman (Putman Soil Testing), and Jennifer Wollenweber (USDA-NRCS) served as the official judges for the contest. John Begun, Dean Johnson, Eldon Gould, NIU, Dunteman Turf Farms, and Garfield Farm Museum were gracious hosts that allowed soil pits to be located on their property. Plaques were provided by the Illinois Soil Classifiers Association. Approximately 15 members and friends of the Department of Geography assisted with grading scorecards during the contest. Leonard Walther put the final touches on the design of the plaques and t-shirts. NIU Geography soil judging team took home 3rd place in both the Group and Team events. Clint Bailey won 3rd place finish in the individual event. NIU team members included: Clint Bailey, Trevor Edmonson, Jacob Kruse, Jennifer LeVine, Wesley Poggenpohl, Ellyn Raimondi, Ryan Strelcheck, Ashley Warren, Norman Yackle. Alicia Lisowski and Steve Hamilton (both NIU graduate students) coached the team. The highest scoring individual from an Illinois university and winner of the Burton W. Ray Scholarship Award this year is Clint Bailey from Northern Illinois University. The top three teams are eligible to participate in the national contest that will be hosted in the spring of 2011 by Oregon State University near Bend, Oregon. This is the third consecutive year the NIU team has qualified for the national contest. Congratulations to all of them! Thanks to the judges, coaches, and volunteers! Dr. Konen has the following to say: "I think I can speak for everyone involved in thanking the volunteers and landowners for all their hard work and hospitality and as usual everyone learned a great deal about soils, landscapes, hydrology, vegetation, and land-use and had fun while participating in the contest. I think back to my undergraduate days at Iowa State University and know that if it was not for the opportunity to participate in Soil Judging I would most likely not have ended up becoming a Pedologist and having the privilege in continuing to participate in this important educational field experience. Thanks to all of you that have supported and continue to support Soil Judging!" Official judges Jennifer Wollenweber (NIU graduate), Mark Bramstadt, Bruce Putman, and Bill Kreznor. Northern Illinois University Soil Judging Team participating in group judging. Volunteers and coaches grading scorecards during the contest. Northern Illinois University Soil Judging Team. Clint Bailey, Northern Illinois University. Winner of the Burton W. Ray Scholarship Award. 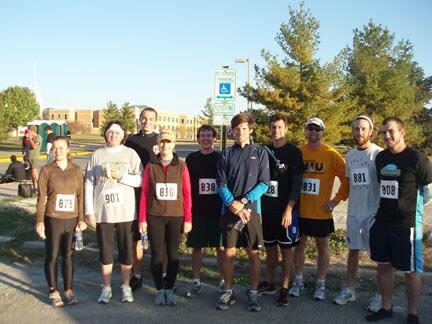 On a beautiful homecoming morning, when the Huskies would defeat Buffalo 45-14, Recreation Services held what was the first (of what hopefully will become an annual event) Run to Victory 5k/1 Mile Walk. The 5k course started at Anne’s Woods, with the first third of the course going through the neighborhood just east of campus and the last two thirds taking runners through campus near the Chick Evans Field House, past DuSable, Psych/Math, around the East Lagoon, north by the Art and Music buildings and ending near Anderson. Awards were given to overall winners, and top finisher in the following categories: freshman, sophomore, junior, senior, graduate student, faculty/staff and alumni. The Department of Geography was well represented at the race and in the winner’s circle with Michael Saxton placing 1st overall. 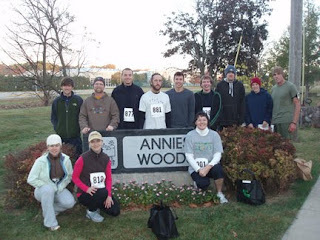 Other winners were Josh Rynders (1st male senior), Meghan Fish (1st female senior), Dan Hansen (1st male grad) and Dawn Sibley (1st female staff). 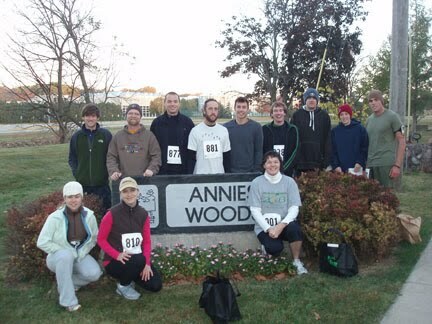 Geographers that also participated but not pictured were Jennifer LaVine, Colleen Mitchell and Alex Stalzer. Congratulations to all! 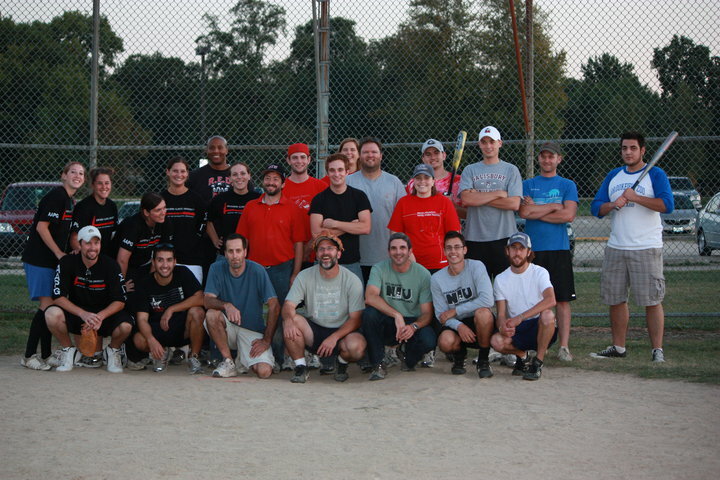 On September 18th the Geography Club co-hosted a softball game against the Geology Club (SGE). The game was a success as we had professors and students play together on both sides and we hope to make this an annual event between the departments. The softball game was played on the field behind the Engineering building and Geology won 11-10. After the game both teams went to Edwardos for dinner to celebrate. If you would like further information on Geography Club, please check the facebook group by searching "NIU Geography Club" for information on upcoming events.